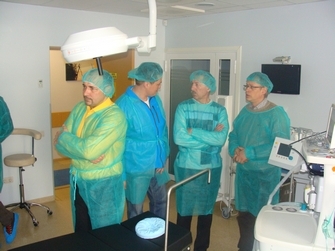 Health Centre 4 (HC4) is the absolute leader in phlebology not only in Latvia but also abroad as this was the first place were numerous contemporary technologies were used. Also specialists of the centre have acquired knowledge at the most highly qualified vein treatment specialists in the world; and mastered all vein treatment methods available in the world. Now the Baltic Vein Clinic of the HC4 serves as the centre for training and scientific testing of the new technologies. Foreign colleagues who have acquired several innovations directly from the Health Centre 4 appreciate knowledge and experience of the specialists. Doctors of various specialties from the Pskov area arrived in Latvia to learn more about the phlebology services available here. Baltic Vein Clinic of the Health Centre 4 was unequivocally selected as the target of this visit. Phlebologist, Head of the Contemporary Medicine Clinic Halsa, Aleksey Kovalev noted that Baltic Vein Clinic offers quality corresponding with the European medical standards, as well as expressed appreciation for usage of mega modern technological devices and application of broad spectrum of methods in the treatment of veins, including, elimination of cosmetic defects. Exclusive bio adhesive* and steam vein sclerosis (SVS) method** which are practically not known in the northern-western parts of Russia were especially highly valued. „As in contradiction to four other countries where veins are treated with the help of bio adhesive, Latvia is a neighbouring country of Russia, its inhabitants get an exclusive possibility to come here and treat veins in the more caring manner,” said A. Kovalev. „Here we have a great team of doctors to learn from and innovative Baltic Vein Clinic whose example to follow. And I hope that this will exactly happen as we are interested in cooperation. Up to now laser surgery and sclerotherapy were applied for the treatment of veins in our clinic. But in the nearest future it is planned to implement one more vein treatment method that would most likely be the steam vein sclerosis method giving us the chance to select the most appropriate treatment method to our patients in a more objective way,” admitted A. Kovalev. * This method is usually applied when initial stages of the varicose veins are treated and in comparison with the previous endovenous methods this method is even less invasive (no scars), very caring to the patient, no pain and hematoma (haemorrhage) after surgery as there is not a traumatic impact onto the vein. Vein is not being removed but safe and harmless to health special biological adhesive is injected into the vein through the disposable catheter, vein is closed and afterwards turns into connective tissues. You don’t have to wear compression socks after the surgery and recovering period is very fast, also number of recrudescence is not observed. Besides there is no need to use anaesthesia and pain killers during the surgery as this adhesive technique method is completely painless – effect of the heat is not used in this method, as it is when using laser, radio frequencies and steam method. ** From 2006 this method is applied in the treating of veins in the world and in 2010 it was selected No. 1 in the European Venous Forum.